MACDILL AIR FORCE BASE, Fla. — President Donald Trump on Monday accused the media of deliberately minimizing coverage of the threat posed by the Islamic State group, saying news outlets "have their reasons" for not reporting what he described as a "genocide" underway at the hands of the group. The president did not immediately offer evidence to support his claim, made during the new commander in chief's first visit to the headquarters for U.S. Central Command. Later, the White House released a list of 78 attacks it described as "executed or inspired by" the Islamic State group since September 2014. The White House said "most" on the list did not get sufficient media attention, although it did not explain how it defined the term. Some of the incidents on the list received widespread attention and deep reporting. "You've seen what happened in Paris and Nice. All over Europe it's happening. 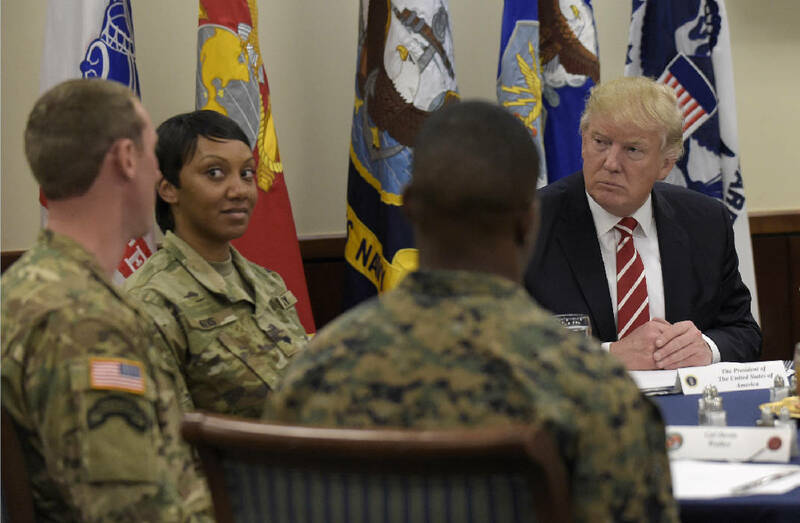 It's gotten to a point where it's not even being reported," Trump told a group of military leaders and troops during the visit. "And in many cases, the very, very dishonest press doesn't want to report it. They have their reasons and you understand that." Trump, who has made relentless criticism of the media a hallmark of his presidency, did not explain why he thinks news outlets minimize attention on such attacks. Later, White House spokesman Sean Spicer tried to tone down the president's remarks, saying it was a question of balance: "Like a protest gets blown out of the water, and yet an attack or a foiled attack doesn't necessarily get the same coverage." The list released late Monday included incidents like a truck massacre in Nice, France, that killed dozens and received widespread attention, as well as less high-profile incidents in which nobody was killed. The AP could not verify that each of the incidents had connections to the Islamic State group. The list appeared to be hastily assembled, including several misspellings of the word "attacker." Trump also used the visit to CENTCOM to defend his immigration and refugee restrictions and reaffirm his support for NATO. He laced his speech with references to homeland security amid a court battle over his travel ban on people from seven majority-Muslim countries. He did not directly mention the case now before a federal appeals court after a lower court temporarily suspended the ban. "We need strong programs" so that "people that love us and want to love our country and will end up loving our country are allowed in" and those who "want to destroy us and destroy our country" are kept out, Trump said. "Freedom, security and justice will prevail," Trump added. "We will defeat radical Islamic terrorism and we will not allow it to take root in our country. We're not going to allow it." Trump touched upon various alliances in his remarks, noting, "we strongly support NATO." He spoke Sunday with NATO Secretary General Jens Stoltenberg. A White House statement said the two "discussed how to encourage all NATO allies to meet their defense spending commitments," and also talked about the crisis in Ukraine and security challenges facing NATO countries. Trump once dismissed the trans-Atlantic military alliance as "obsolete," and said he would decide whether to protect NATO countries against Russian aggression based on whether those countries "have fulfilled their obligations to us." Speaking as commander in chief, Trump repeated his promises to defeat "radical Islamic terrorists" but provided no specifics on any policy changes he wants in the fight against the Islamic State. Before his remarks, Trump sat down for lunch with a room full of troops in fatigues from the Army, Navy, Air Force and Marines, as well as senior members of his White House staff. Trump made small talk with some of the soldiers, discussing everything from football to military careers. "Gonna make it a career?" Trump asked one person. "C'mon, you have to stay," he urged another. Trump also hailed New England Patriots quarterback Tom Brady, saying he "cemented his place" in football history after his fifth Super Bowl win Sunday. Trump stopped at the base on the way back to Washington after his first weekend away from the White House. Trump spent the weekend at his estate in Palm Beach, Florida, with first lady Melania Trump, who had not appeared in public since shortly after her husband took office. At MacDill, the president was briefed by CENTCOM and SOCOM leaders. A number of his advisers, including Gen. Joseph Dunford, the chairman of the Joint Chiefs of Staff, and Michael Flynn, Trump's national security adviser, also attended. Trump met with Florida Gov. Rick Scott before delivering his remarks, telling the crowd at CENTCOM that Scott's endorsement of his candidacy for president "makes him a better friend of mine," adding that with those who don't offer their endorsement, "it's never quite the same." CENTCOM oversaw a recent raid by U.S. special operations forces on an al-Qaida compound in Yemen, the first military operation authorized by Trump. A Navy SEAL, Senior Chief Special Warfare Operator William "Ryan" Owens, 36, of Peoria, Illinois, was killed, making him the first known U.S. combat casualty under Trump. Three other U.S. service members were wounded in the operation. More than half a dozen suspected militants and more than a dozen civilians were also killed, including the 8-year-old daughter of Anwar al-Awlaki, a radical cleric and U.S. citizen who was targeted and killed in 2011 by a U.S. drone strike. Trump made no mention of Owens or the raid in Yemen during his remarks Monday, but he paid recognition to the sacrifices of American military families and the spouses of American soldiers, vowing his support to those who risk their lives for the country. "We protect those who protect us, and we will never, ever let you down," he said.